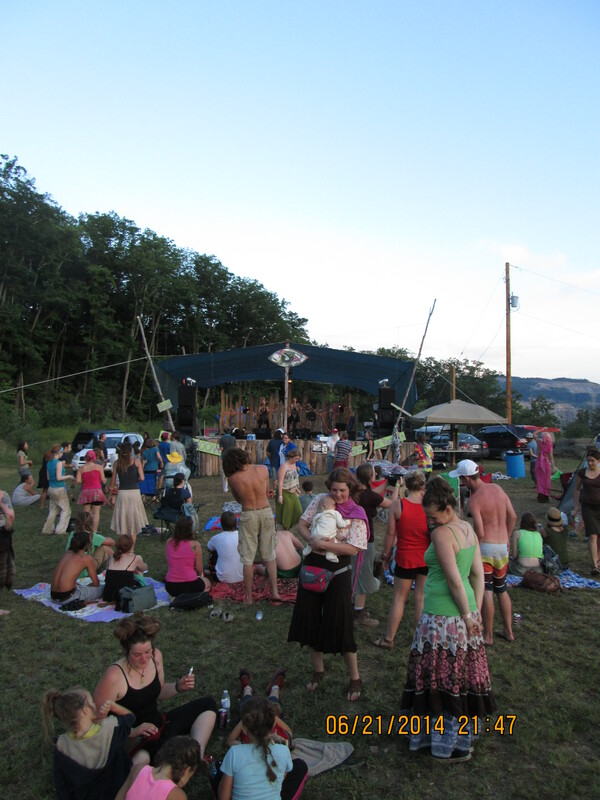 ​We can’t wait to see you all at the Mountain Justice Convergence this June! 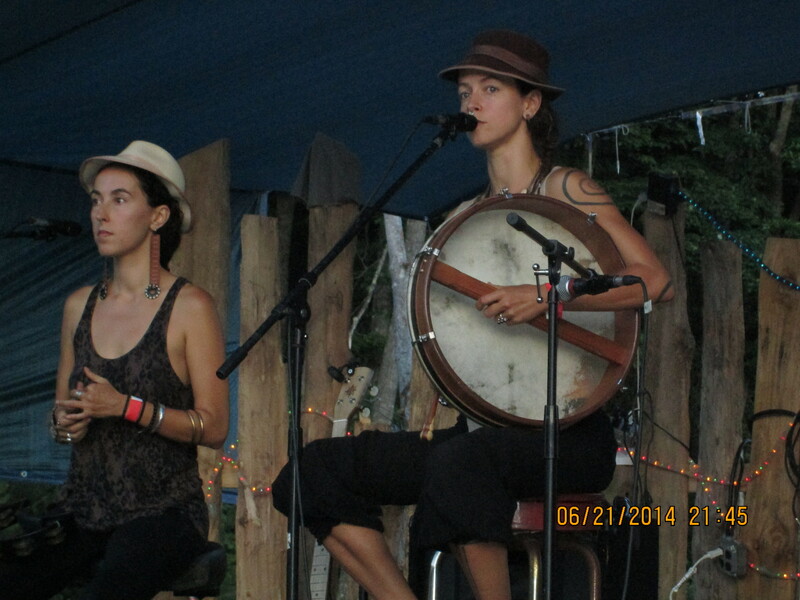 This year, MJ is branching out from our traditional summer camp model to meet the evolving needs of a network that has built up over MJ’s 10 years of resistance to the destruction of Appalachia. Over the last decade, this time together has become an important place for organizers doing powerful work in Appalachia to share stories, collaborate, build the movement, and just hang out in lovely spots in the mountains. 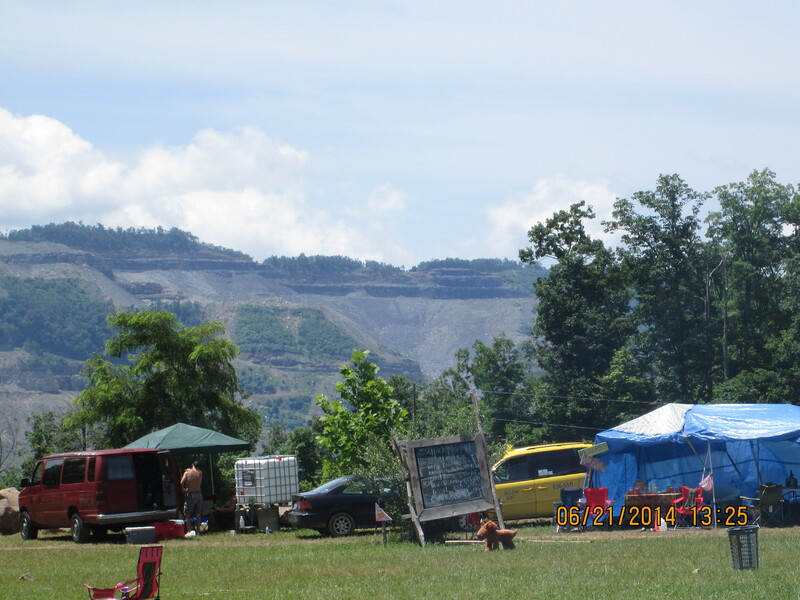 Our spot this year is in the Kanawha State Forest, close to Charleston, WV, and right next to a sprawling strip mine. 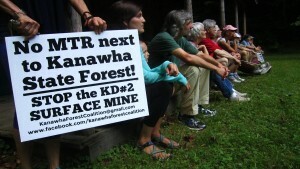 The location is beautiful and intentionally chosen: not only will we get to hike and bike in these lovely mountains with friends old and new, but host organizers with the Kanawha Forest Coalition will share experience from the campaign to permanently shut down the KD #2 Mine. Camp this year will be a place for grassroots organizers fighting coal and other extractive industries in Appalachia to convene, but we’re also inviting activists working on related justice issues. We acknowledge that environmental movements have the best chance of effecting meaningful change if we identify the systems of power that destroy the land and actively confront all forms of oppression that perpetuate their power. Join us as we discuss our work, talk about the future of the struggle in our region, and figure out how to make this movement an ever more potent and relevant agent for radical change in our society. Below you can find more details about how camp will look, what it will be about, and where you fit in. If you already know what we’ve got planned and are ready to register, sign up for Summer Camp here and the Organizer’s Gathering here! We’re excited about getting your feedback on what conversations you want to see happen, so please take a moment to let us know you’re coming and help us shape this event. Camp will be located in the Kanawha State Forest, close to Charleston, WV. We will be camping at the Johnson Hollow picnic shelter, which is on the main road through the forest. Directions: It is possible to get to Kanawha State Forest from Corridor G, also known as US 119, heading south from Charleston. There are a lot of turns but you can follow the signs from US 119 all the way to Kanawha State Forest. Once you enter the forest, stay on the main road, go past the swimming pool and Johnson Hollow will be on your left. There will be some signs to guide you through the park. Probably the easiest way to get to the event is to take Interstate 64 east of Charleston and then get off at the WV 94 / Marmet exit, then head south on WV 94. About 3-5 miles south of the interstate, you will see a sign on the road pointing right towards Kanawha State Forest. Stay on this road to Johnson Hollow on your left. There will be some signs. Our Summer Camp will run from Saturday May 30 and everyone is welcome to stay through Tuesday night June 2. 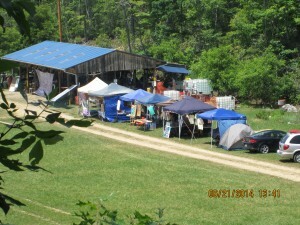 The Appalachian Organizer’s Gathering will be Thursday June 4 through Sunday June 7. Wondering what’s going on Wednesday? Show up for a surprise! Tent, sleeping bag, pillow, ground cloth, headlamp or flashlight, boots or whatever you like to hike in, camera, note pad, poncho or rain gear, your coffee cup or go cup, water bottle, any personal medications you may need, a leash for your dog, mountain bike (optional) and helmet, folding camp chair, a bandana, musical instrument, toys and games, and any literature or zines that you would like to share with others. 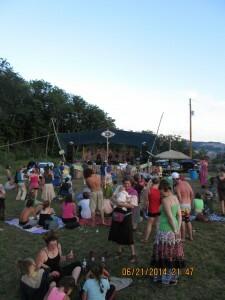 Over the last decade, camps have focused on educating, training, and recruiting people new to the movement. But the space has also become an important opportunity for Appalachian organizers to learn from each other, strategize about our shared goals, and spend quality time together. We are shaping this year’s event to accommodate these different sets of needs. We acknowledge that it is not easy for everyone to take a week off for even the most important events.That is why the week is divided in half to help people prioritize their time. The first four days will be a series of workshops and discussions that will introduce people to the work that Mountain Justice engages in, and the social, political, and cultural context of that work. We’ll also take time to enjoy our surroundings– hiking, playing music, learning about local flora, picking up some climb skills, biking, relaxing, playing games, dancing, etc. Keep in mind that these days will be loosely facilitated and flexible to the desires of those around each morning. There will be service projects available, field trips and a panel with our hosts this year, the Kanawha Forest Coalition. 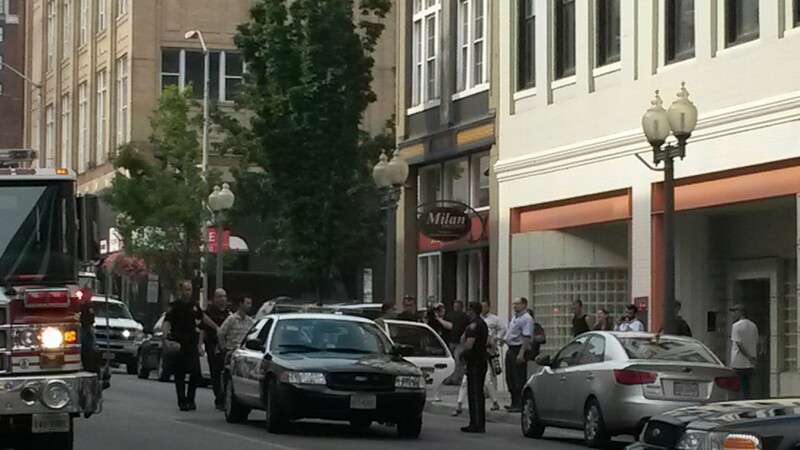 This is not intended to be an action camp. Mountain Justice has by no means abandoned direct action as a means of change, but many of us have recognized the need for more long term campaign work. Come spend a few days with us and we’ll fill you in! Register here! Long term organizers, please feel free to come out for this and share your experiences. We promise it will be low key but you are also welcomed to facilitate workshops, morning circle etc. The latter four days are what’s “new” this year. At this 4-day “organizers’ gathering”, we hope to see more intentional conversations, opportunities to share our work and plan together, and spots for learning and trainings most relevant to our needs. Important conversations are sure to unfold as we delve deeper into our strategies and larger visions for this movement. But we’re also leaving ample time for fun! Newcomers are more than welcome to stay for this portion of camp and find ways to plug in. Just keep in mind that this will be a space for people who are already organizing in Appalachia, or around similar issues elsewhere, to meet each other and better their work, so the conversations will be hard to access without some amount of experience or exposure. We will have loosely facilitated discussions, games, and service projects to offer for the first half of camp, but it will look more like what people make of it. We are making more intentional decisions with the second half of camp and to make it easier for the right people to be present for these discussions, we will soon be posting a calendar with daily agendas determined by the availability of certain organizations for each day. Keep in touch! We envision convergence as a movement-building space at which we will discuss how to confront oppression within our work and in society, how our work relates to just transition, how we can work together more strategically, etc. We will be scheduling a few pre-planned and facilitated conversations or workshops every day, but we will also have ample unscheduled time to leave room for participants to self-organize directed conversations and break-outs. This will allow us to be flexible and spontaneous and leave time for rambling, woodsiness, and the inspiring conversations that happen organically when we’re all together. We’re excited to see all members of the amazing community we’ve built over the years. If you’ve been involved with MJ at any point in our history, come see old friends and meet new ones, share your stories and talk about the exciting work you are doing these days. We’re also extending our invitation to organizers doing radical work toward justice issues who may be working more on our periphery. A coherent analysis of our environmental crises demands we acknowledge all forms of oppression that serve the systems of power which destroy the land. While standing together demanding an immediate end to surface mining in Appalachia, we also want to collaborate with allies who are doing other kinds of organizing but who share our vision of a world free of social, environmental, and economic injustice. So that’s it! We’re pretty psyched to be kicking off the summer with this convergence. Remember, none of us is working alone: we’re a movement, and let’s put our heads together and figure out how to make that movement even stronger. Join us! We would love to hear any comments, or requests for workshops and information you’d like to see. 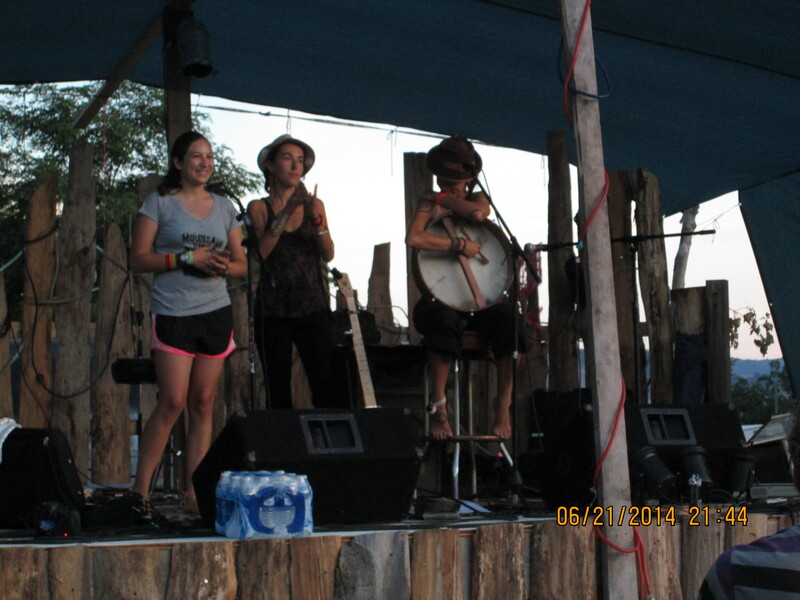 Remember to register for the Summer Camp and/or the Organizers’ Gathering, and there you can enter your suggestions. You can also email us. And please spread this invitation to any organizers you would like to see present! Saturday night: first meal served. Please register for MJSC so we have enough food for you and your friends! 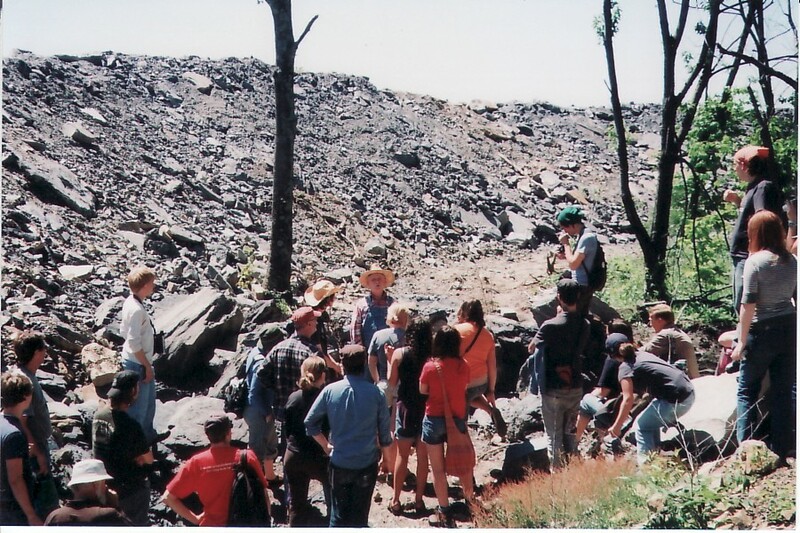 Sunday May 31: Schedule for the day to be determined at Morning Circle (9:00), possible trip to Kayford Mountain to see mountaintop removal mine around Larry Gibson’s homeplace. ** If you would like to lead a workshop during the first part of MJSC, please bring your workshop materials to the convergence and plan to announce your workshop at the Morning Circle. We are excited to announce that for the fifth year in a row the RReNEW Collective and Southern Appalachian Mountain Stewards (SAMS) will be hosting Mountain Justice Spring Break in Virginia from March 7-14, 2015 at beautiful Natural Tunnel State Park in Southwest VA.
As a participant, you’ll engage with the environmental, health, economic, and social impacts that decades of coal mining as a mono-economy has had on Appalachian communities, and learn about organizing and resistance efforts. Beyond mountaintop removal, you’ll learn about a broad range of environmental and social justice issues in Central Appalachia, and the exciting work being done by community groups to transition the economy and build resilience. Our days will consist of workshops, service field trips, and opportunities to network with other activists, and our evenings will wind down with citizen and local organizer panels, music and campfires, and story-sharing with a diverse group of others working for social justice. Over the course of this event, we will meet and support the folks working to build a better future for Appalachia, build our own skills as organizers and change agents, and along the way have fun, go hiking and put a little elbow grease into local service projects! Over 100 people are expected to attend. Make new friends and meet other concerned, caring young activists at MJSB! 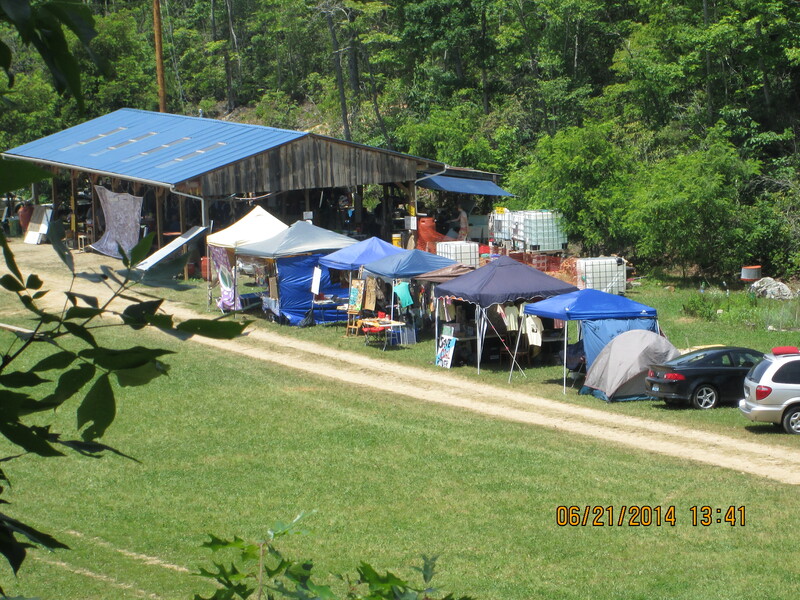 On June 20th of 2014, eight people were arrested for blockading the Alpha Natural Resources headquarters in Bristol, Virginia. In this action, we were continuing Mountain Justice’s ongoing campaign to stop Alpha from strip mining Coal River Mountain. 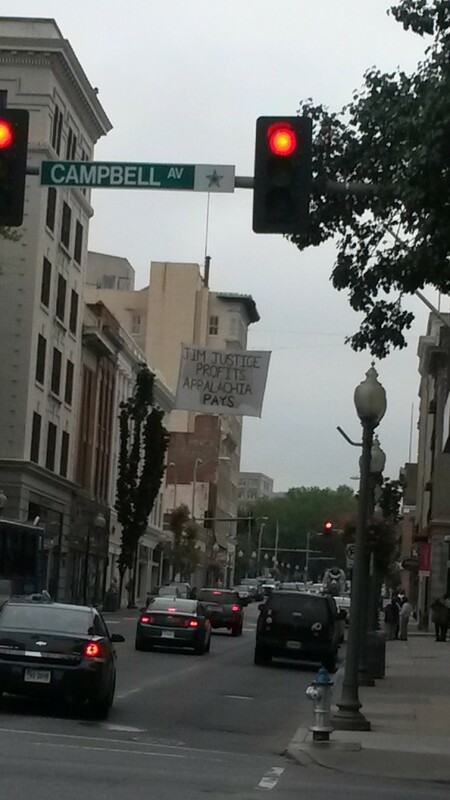 We were protesting to keep the water in neighboring communities drinkable, to keep cancer rates from skyrocketing, and to push for a healthy transition away from the coal economy in Appalachia. Unfortunately, Alpha was in no mood to play around. We were hit with heavy fines for ridiculous claims, such as the damage that police did to Alpha’s front doors during their attempts to extract us. We now face $4,064 in fines. As large as that is, though, I think we can get there. The size and commitment of the Mountain Justice community has never ceased to astonish me. If we all pitch in what we can, we’ll be off the hook and ready for another action in no time! Springhouse Community School is a cool alternative school in Floyd County Virginia (which is near Blacksburg VA). Springhouse features an eco-village and this is where we will hold our Annual Meeting. 718 Franklin Pike Floyd, VA 24091. Please Register to let us know you are coming, and so we have enough food. Mountain Justice Fall Summit – Kayford Mountain West Va.
Join us for the Mountain Justice Fall Summit on Kayford Mountain in West Virginia ! We’re very excited about about this year’s Mountain Justice Fall Summit– we’ll celebrate the changing of the leaves at the beautiful Stanley Heirs Park on the edge of destruction. For this year’s fall summit we’re gathering a diverse group of folks, including local community members, Appalachian organizers, and college students, to create an inter-sectional gathering to discuss the many issues affecting our communities more holistically: Mountaintop Removal, Fracking, Water, Health, Drug Addiction, Jails and Prisons, Colonization, Local Plants, Military Industrial Complex, Direct Action, Community Organizing, Disaster Response and much more. Since 1986, the destruction of Kayford Mountain has been continuous — 24 hours a day, seven days a week. 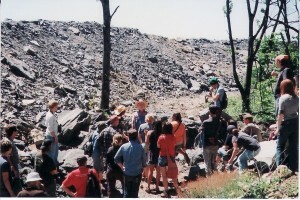 Now eighteen years after the mountain top removal project began, Stanley Heirs Park is the highest point of land around and is surrounded by more than 7,500 acres of a forested and towering mountain range. Larry Gibson’s family, the Stanley Heirs, have successfully protected a piece of the land that their family has lived on since the late 1700’s through the creation of the 50-acre Stanley Heirs Park. At the Park, there’s area for folks to camp and we will have big army tents set up with wood stoves for folks to stay in and for workshop space. The MJ Fall Summit kitchen will provide all your meals. Participants should come prepared for the possibility of cold,wet weather and pack for the day or for the weekend accordingly. The cost for MJ Fall Summit is a sliding scale ($50–$200) with no one turned away for lack of funds. Support the Mountain Justice Legal Defense Fund! 5 activists with Mountain Justice, Ramps Campaign and Rising Tide North America were arrested this morning while delivering a message to billionaire coal baron, Jim Justice: Clean Up Your Act, now! 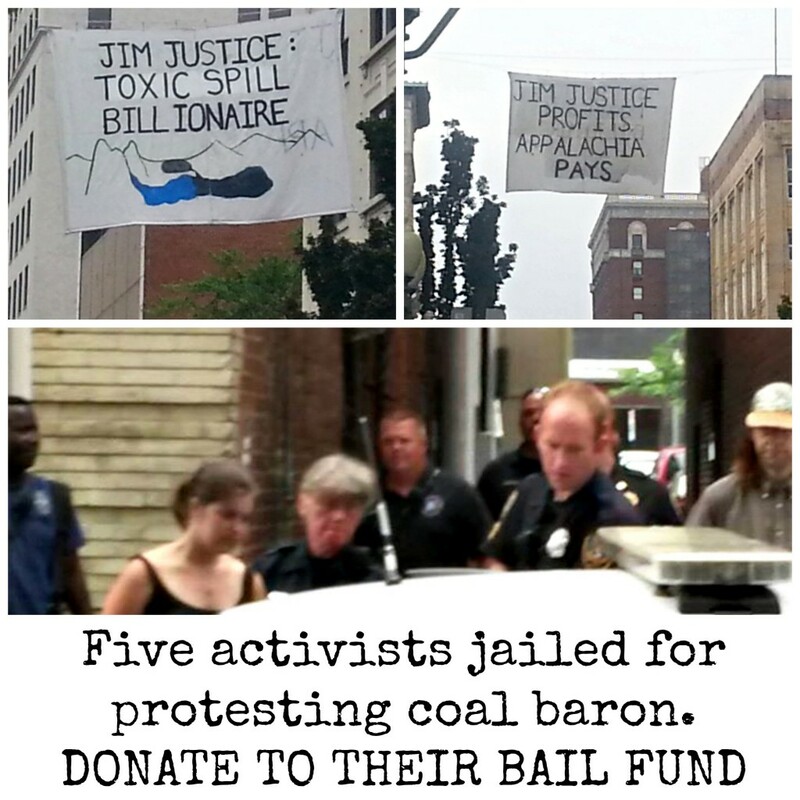 Today they’re being held in the Roanoke Jail, but you can help support these folks, this action, and any more that may come in the ongoing effort to hold coal barons accountable for the destruction of Appalachia, by donating now to the Mountain Justice legal defense fund. 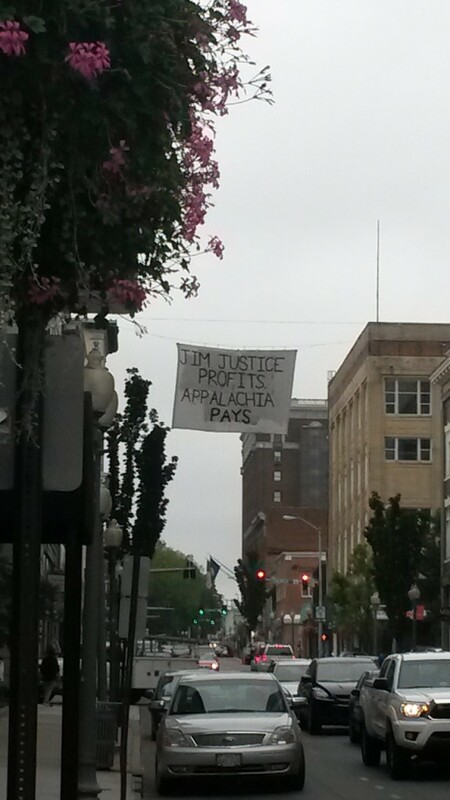 Roanoke, VA – Early this morning members of Mountain Justice, Rising Tide North America and Radical Action for Mountain and People’s Survival (RAMPS) hung a banner, suspended between two downtown buildings on Jefferson street in Roanoke. The groups are acting in support of community demands in Virginia, Kentucky, West Virginia and Tennessee that billionaire coal baron Jim Justice stop poisoning water, exposing communities to devastating mountaintop removal coal mining operations and leaving central Appalachia a public health disaster. 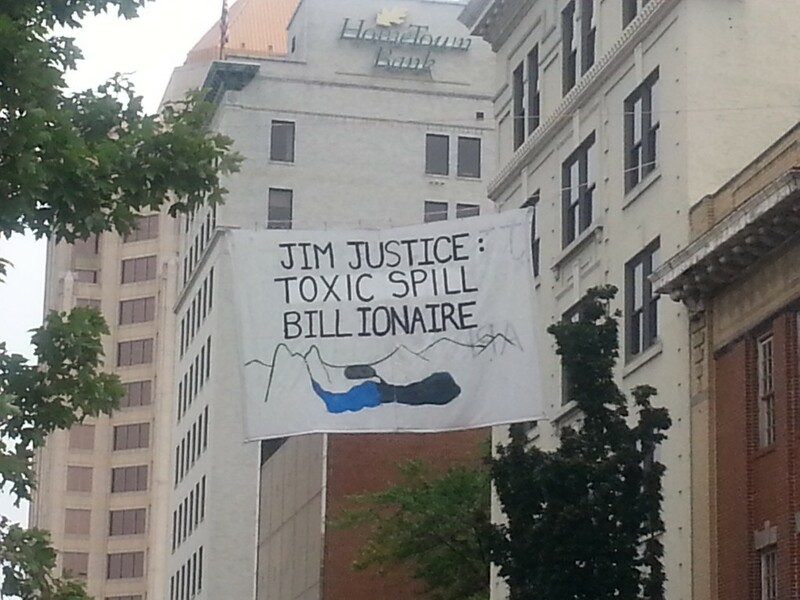 The banner reads; “Jim Justice Profits, Appalachia Pays.” and “Jim Justice, Toxic Spill Billionaire”. 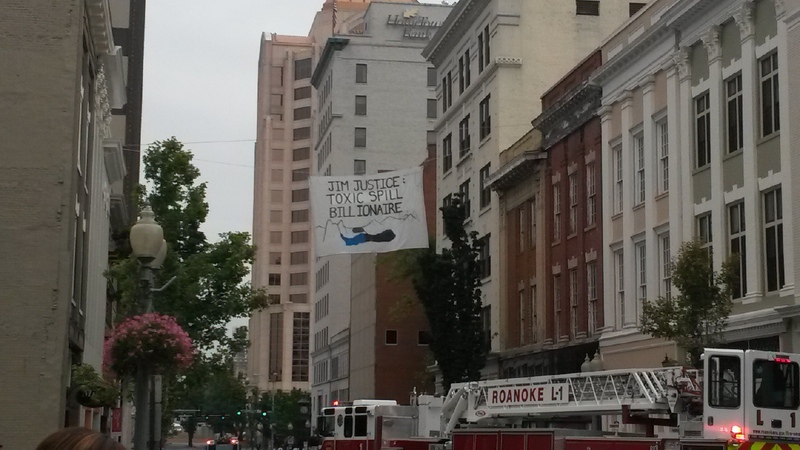 Today’s action comes after weeks of bad news for the Justice Group and Roanoke-based Southern Coal. From $9.9 million in new bonding fees, and fines of over a million dollars in Kentucky, to cessation orders in Tennessee and bond forfeitures in Virginia, Justice’s corner-cutting practices across the region show that community concerns are grounded in reality. 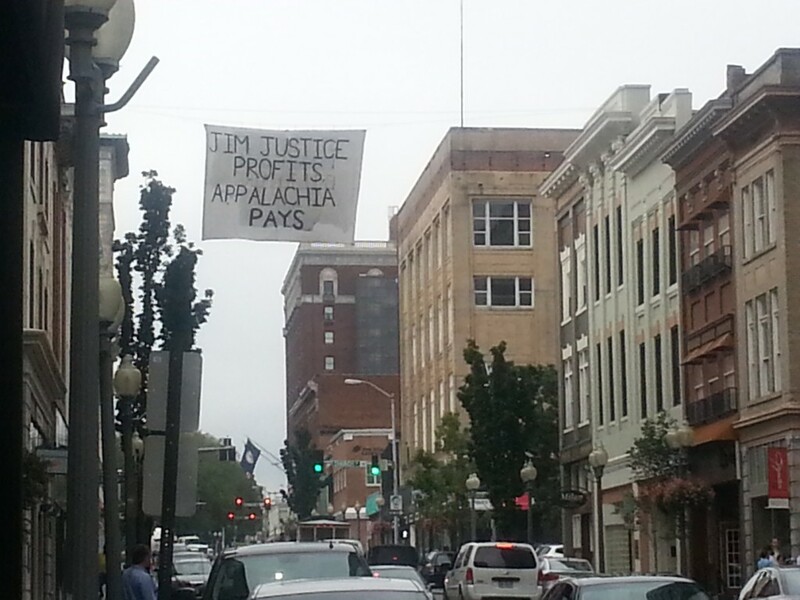 Mountain Justice and allies call on people to support the groups most impacted by Jim Justice, like the Southern Appalachian Mountain Stewards in Virginia, in their push to hold the billionaire responsible for the damage he’s caused. Today’s action is part of a long tradition of non-violent civil disobedience addressing social justice and environmental issues. 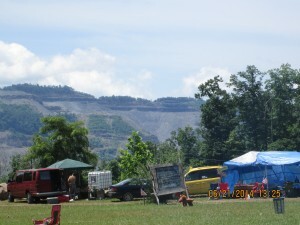 Like in the civil rights era and movements to stop the destruction of forests, oceans and the climate, regulatory and political solutions to stopping mountaintop removal have proven ineffective and people working to stop the destruction of Appalachia’s Mountains have taken the next logical step in confronting coal barons like Jim Justice. Mountain Justice is a regional Appalachian network committed to ending mountaintop removal. Rising Tide North America is an all-volunteer climate justice network working to confront the root causes of climate change. MJ Summer Camp and Supermoon Photos!